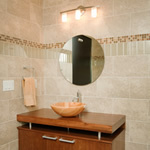 Information is the first tool you need when considering a bathroom remodel. Whether you're just trying to improve the looks of a very tired room, or you're ready to bump out a wall or two and create a luxurious home spa, a bathroom remodel takes expertise and imagination. This website covers the gamut from inexpensive cosmetic touch-ups to a full bathroom face lift. Watch videos ranging from repair tasks for bathrooms to decor considerations to creating an indoor-outdoor look. Compare bathroom remodeling cost estimates and read articles about return on investment, convenient accessories, heating and ventilation, mold remediation, and other remodeling topics specific to bathrooms. For anything more than minor upgrades, you will most likely need a bathroom remodeling contractor. Learn how to find local contractors, check their reputation, and negotiate a contract. Home Improvement Center will help you find deals on bathroom products and project costs. Spend some time researching and be ready to start visiting showrooms and get your project started.